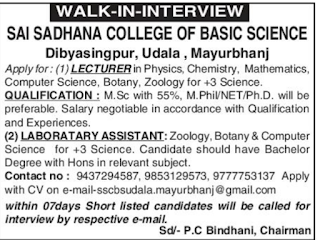 Sai Sadhana College of Basic Science, Udala has advertised in the SAMAJA newspaper for recruitment of Teaching Faculty- Lecturer, Lab Assistants jobs vacancies. Interested and eligible job aspirants are requested to apply within 7 days.Check out further more details below. 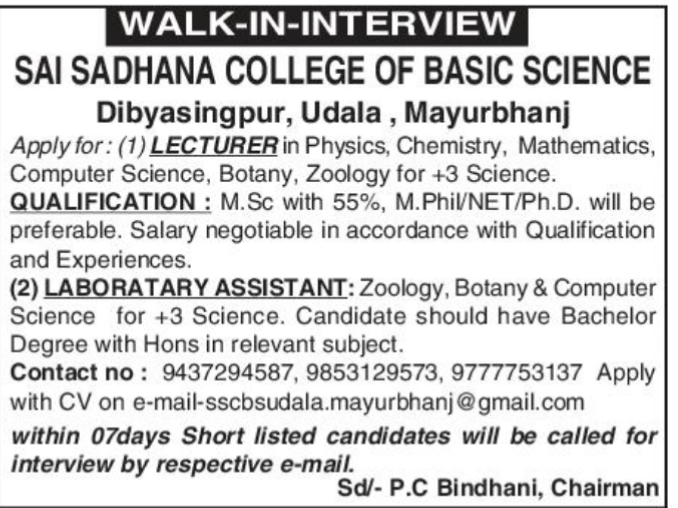 Name of the College : Sai Sadhana College of Basic Science, Udala,Mayurbhanj,Dibyasingpur. M.Sc with 55%, M.Phil/NET/Ph.D will be preferred. Lab Assistant :Candidate should have bachelor degree with Hons in relevant subject. Salary Negotiable in accordance with qualification and experience. Shortlisted candidates will be called for interview by respective e-mail. Sai Sadhana College of Basic Science, Udala,Mayurbhanj,Dibyasingpur. Last Date: With in 7 days.